Hello guys, yesterday all Airtel customers got a beautiful new year surprise. A beautiful new year wish that will make most of us unhappy. Lets read whats that message. What? SMS are chargeable on 31st December and 1st Jan 2017. Seriously? What Airtel is trying to prove?. Ans see the wording of this message, Nav Varsh Ke Avsar Par, AApke Airtel Pack ka koi bhi benefit maanya nahi hoga. Why Airtel? I am paying you charges for SMS pack in advance and still you want to earn more from your regular customers? It would be a big new year gift if you say Calls and SMS are free for new year week but in that case your tag of money hungry operator will be removed which you don't want to lose i guess. This is a 4G era and everybody is now using internet calls and instant messengers. More than 70% mobile users are now using instant messengers like WhatsApp, Line, Wechat etc and only few percent are still using SMS for chatting with friends. Still when few people are using SMS for chatting, you are now going to charge them money. What if they don't have enough money for texting? For those two days, how would they contact with their loved ones? Is not it a matter for shame to India's Big Telecom company who is pushing limits on their users? Like if i am getting 100 Free SMS at rs 9, I have to pay rs 100 on 31st December and 1st January. It doesn't matter what plan you are using. Pay for your existing plan and get no benefits on these two days and also pay extra for sending SMS. It's like 9rs for my regular SMS plan + 100 Rs for sending 100 SMS, so it means you are paying 100 Rs extra with rs 9 to get same offer. I am very unhappy with Airtel, as there are only few SMS users are left in our country. Everybody is using Instant Messengers for communication. And soon there everybody will be using indtant messengers only. I am a 8 years old Airtel customer and never got any good news from them. Every time they come up with money laundering schemes. They are already suffering huge loss because of Jio and that loss is not actual loss, it's estimated loss which is like they can earn 100 Rs but was able to earn only 50 so they usually show it as 50 RS loss. It's my appeal to Airtel, please learn something from Reliance Jio. They are earning good still they are giving calls and SMS for free and yes there is no Blackout word in Reliance Jio. No Free pack where you has to pay rupees. India is a big market, you can earn little from one customer to make huge profit from 125 crore Indians while Airtel is trying to earn maximum from every customer. 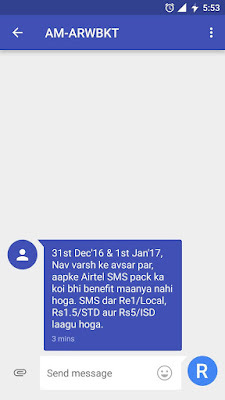 Happy New Year to My dear Readers and to Airtel as i am willing to Port my number if i see a single rupee charged for SMS.